Happy Monday, Friends! I'm finally catching a moment in between baby feedings and toddler melt-downs to give you the highlights of Joseph's baptism. The night before our children are baptized, I lie awake, unable to sleep, thinking about how beautiful and meaningful the sacrament is. The joy in my heart is indescribable! Our parish priest suggested that we celebrate the baptism on Saturday afternoon, which I thought was perfect, because it would give me an entire morning to get prepared. But, of course, you all know how that song and dance goes. Sure you have plenty of time to get ready, but in the end, no matter how planned and prepared mama is, everyone always ends up racing out the door at the last minute combing hair, tucking in shirts and you're trying not to lose your grip along the way! Father Aaron is a truly wonderful priest. 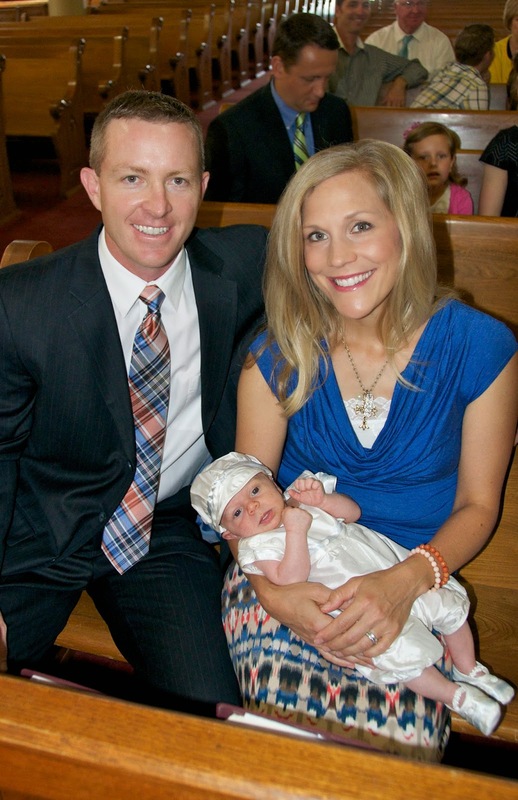 He welcomed our family into the church that afternoon with open arms, and his unmistakable grin. Our boys just love him, I can see the respect and admiration they have for him in their eyes and in the attentiveness they give him during mass. 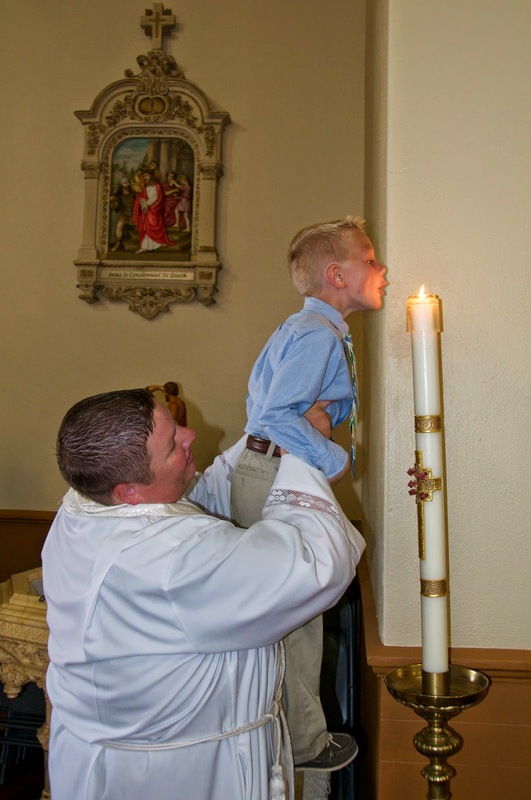 The rite of baptism is beautiful, the prayers are rich with meaning, many of them mirroring the prayers of the funeral rite, both marking our entrance into and exit from this world. 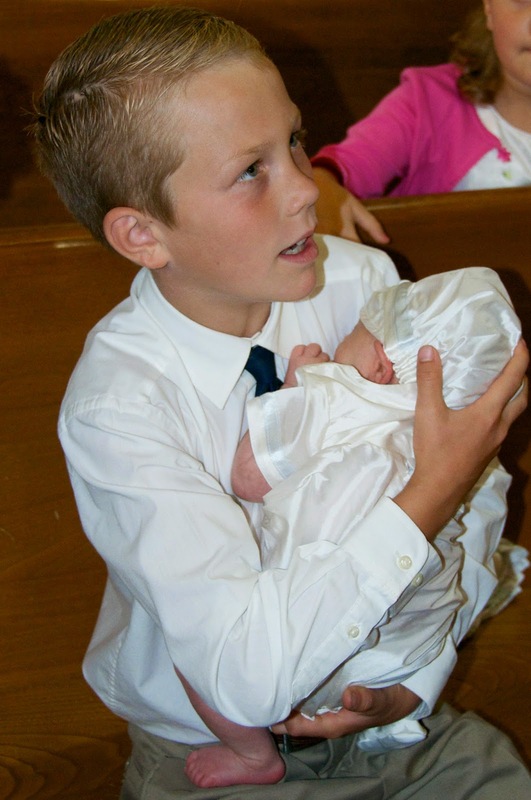 I try so hard each time our children are baptized to hold back my tears, but it really is impossible. When I start to think about the generous love God has for all of us, that he would allow us to experience that love through the tangible means of cleansing water, anointing oils, burning candle light, and the beautiful prayers of blessing spoken by the priest, prayers gifted to the church through the inspiration of the Holy Spirit, I am truly overwhelmed! 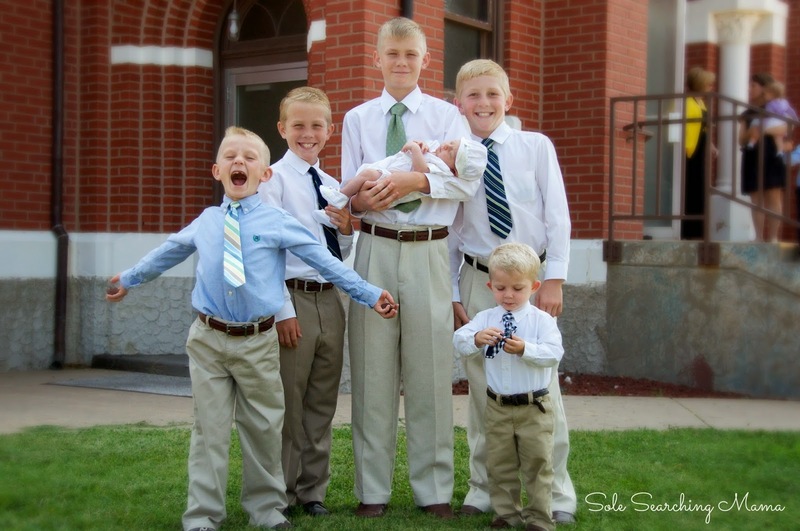 Steve and I had a similar experience of looking out upon our five older sons, all who have been baptized, and feeling so much joy as they proudly celebrated the sacrament with their youngest brother. 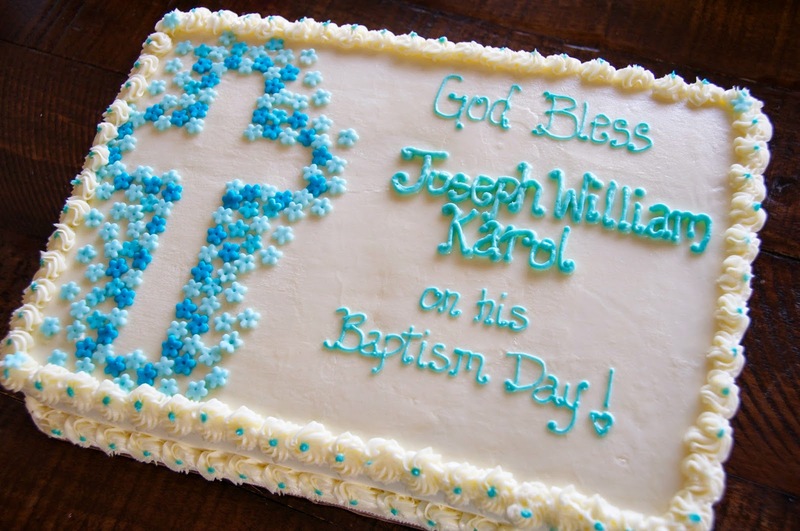 They really knew that it was a very special day for Joseph, even Charlie sat quietly through the baptism, watching closely with sweet attentiveness and curiosity. George is always first line when it comes to holding Joey. It's hard to describe the intensity of the desire that I had to pray for our each one of our sons during the baptism. I want so much for each one of them as individuals to live fully the graces of their own baptism, and to experience their own personal relationship with our Lord - not mine, not Steve's. Raising hearts for Christ requires great faith on our part as parents, and a firm resolution to pray continually for our children, trusting in God's plan for their lives. 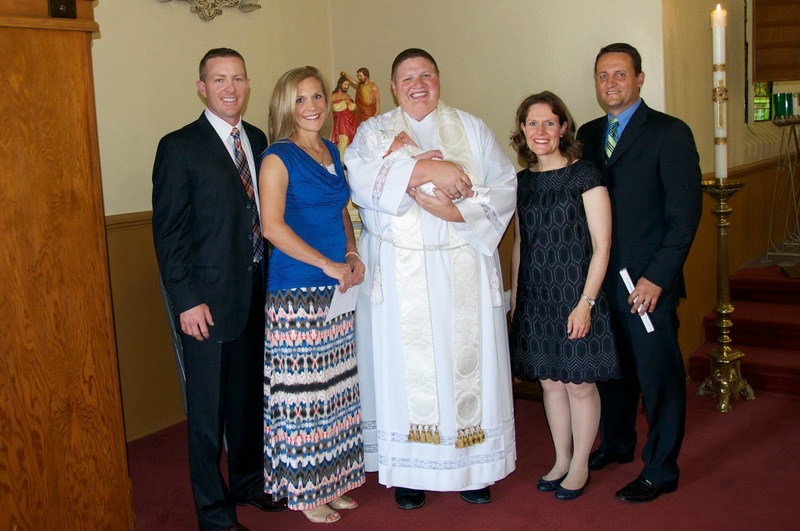 My sister, Sara, and her husband, Johannes, happily accepted our invitation to be Joseph's Godparents. The timing of the baptism was perfect, since they had traveled to the States with their children from their home in Switzerland to visit family for a few weeks this summer. 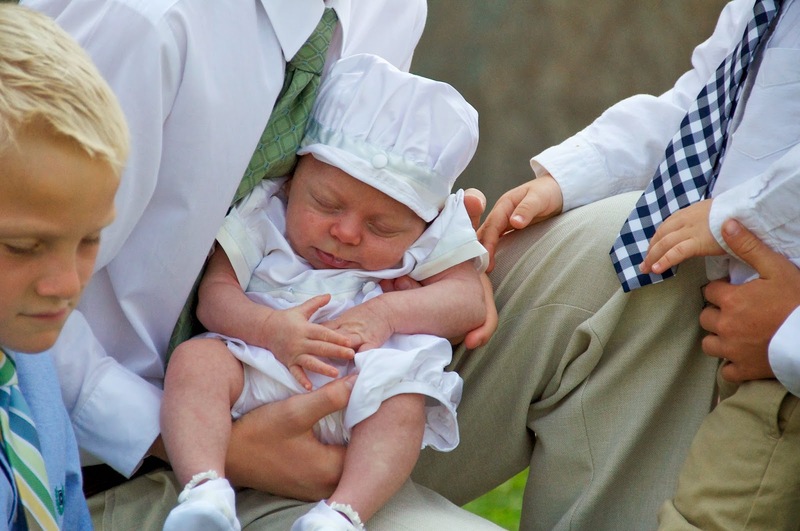 After the baptism was over, I really wanted to capture the joy of the afternoon in a few pics of the boys. 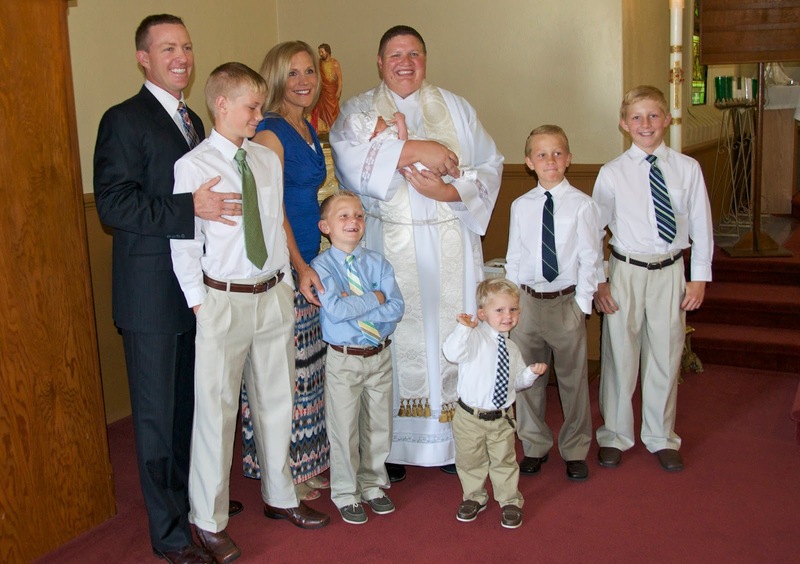 We handed Joseph over to Benedict and it didn't take long for all of them to gather around Joseph, baptizing them in their own way with a smothering of hugs and kisses. The Band of Baptized Brothers! Notice how one of the gang is not dressed like the others? Welp, you know every important event must have a fashion emergency. The morning of the baptism, I was gathering up everyone's attire for the afternoon when I realized Henry's white shirt was missing. After a little digging around, I found it buried in the corner of his closet. Big surprise. For a moment all hope of matching was not lost, until I saw the smears of crusty chocolate fingerprints left lingering from the Easter egg hunt our church hosted for the kids after mass last spring. We call this the picture of providence. Andrew often talks about being a priest one day. When he saw this photo, he said, "Mom, it looks like I'm blessing everyone. 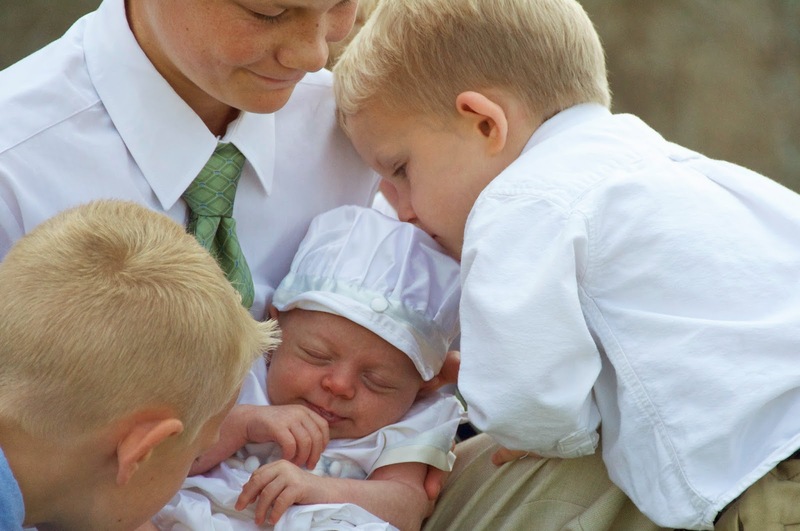 Wouldn't it be great if I could baptize my brothers' kids someday?" Oh, my, would it ever. I was too busy enjoying the post-baptism festivities to take very many pictures. But, I wanted to include a shot of Joseph's cake. Isn't it beautiful? My amazingly talented friend, Missy, kindly agreed to share her culinary gifts with all of us. A sweet way to end such a special day! we are reborn to everlasting life. may he continue to pour out his blessings upon these sons and daughters of his. faithful members of his holy people. Congratulations!! I love the pictures of the "Band of Brothers"! What a beautiful (handsome?) family you have! I love EVERYTHING about this, Susan!! 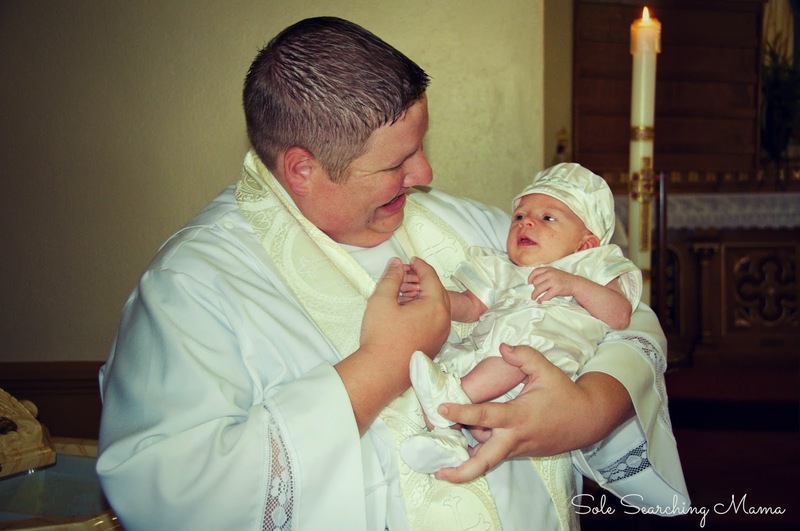 The pictures are beautiful, and there's nothing better than a little one's baptism! It's just not a christening without a big cake! Your boys will love looking back on these pictures one day. Congrats to the little guy on his big day! I so enjoy your posts when they are full of your good-looking family. The love and joy they share with and for each other is abundantly clear. 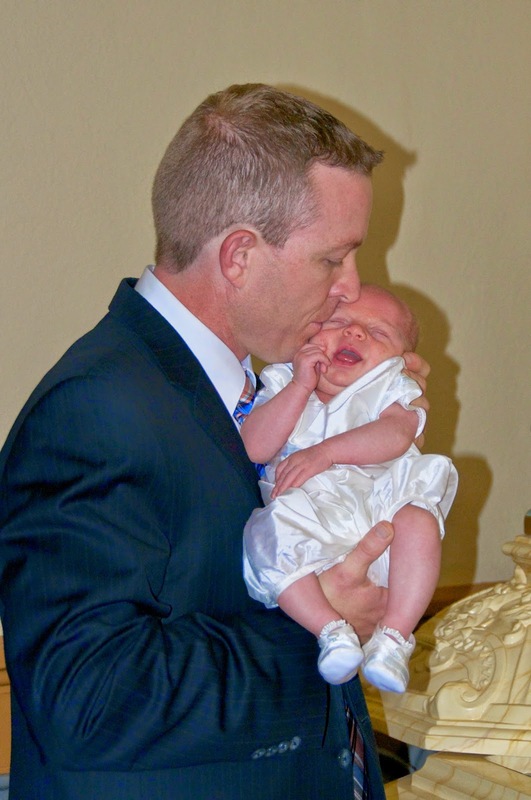 After one of my kids is baptized, I never put the baby down until the chrism smell dissipates. Love that smell. I cried at every baptism. How can you not, knowing what it means? I can't even begin to imagine how full your heart was that day - just seeing the pictures is incredible!! Your family always looks so very sharp and happy!!! These boys are just overwhelmingly adorable. 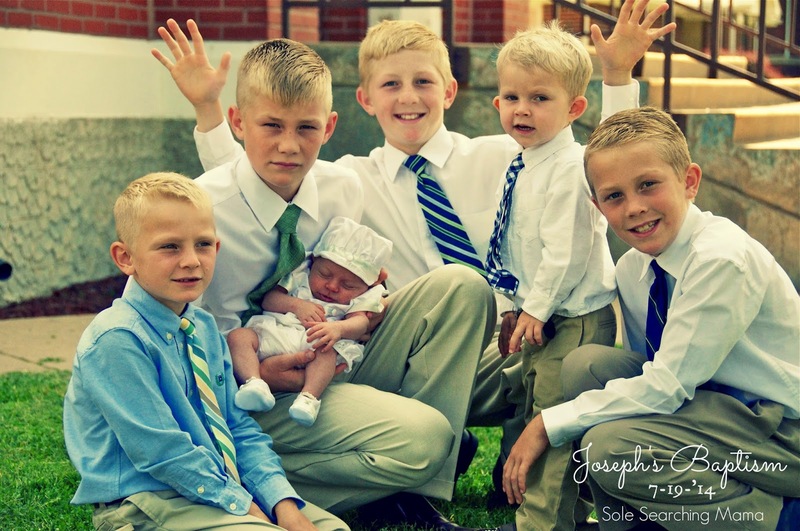 I always dreamed of having a passel of sons, but God has seen fit to shower me with little girls. Their closeness is apparent and beautiful, obviously they are learning well from their wonderful parents! What an absolutely lovely day. Congratulations to sweet Joseph! What a gorgeous family you have! These pictures are great - even if one is not quite like the others! Congratulations! What a blessing, and don't feel bad...I cry at baptisms of kids I don't even know! SO BEAUTIFUL!! Congratulations to sweet little Joseph! Thank you for sharing this wonderful day with us, God truly is so good!